An electrode through which charge carriers (holes or electrons) are forced to enter the high-field region in a spacistor. An apparatus containing a nozzle in an actuating fluid which is accelerated and thus entrains a second fluid, so delivering the mixture against a pressure in excess of the actuating fluid. A plug with a valved nozzle through which fuel is metered to the combustion chambers in diesel- or full-injection engines. A jet through which feedwater is injected into a boiler, or fuel is injected into a combustion chamber. a jet pump used to compress gases and vapors and to force liquids into various devices and reservoirs. Injectors are used in locomotives and locomobiles, as well as in small boiler installations (see Figure 1) to supply feed water to steam generators. The advantages of injectors are the absence of moving parts and the simplicity of operation. The operation of injectors is based on the transformation of the kinetic energy of a steam jet into the potential energy of water. Three cones are located coaxially in the common chamber of an injector. Steam is conveyed through the steam duct into the steam cone. The steam develops a high velocity in the outlet of the cone and carries with it the water supplied through the duct from the tank. 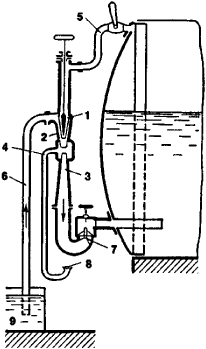 The resulting mixture of water and condensing steam is driven into the water (condensation) cone and then into the injection cone, and from there through the check valve into the steam generator. Since the injection cone widens, the velocity of water decreases in it, and the pressure increases and becomes sufficiently high to overcome the pressure within the steam generator and to inject water into the generator. The excess water formed at the start of the injection cycle is expelled through the valve of the overflow pipe. The temperature of water entering the injector should not exceed 40°C, and the suction lift should not exceed 2.5 m. Injectors may be installed either vertically or horizontally. Injectors designed for drawing off gases, vapors, or liquids are called ejectors. a device used to atomize and inject liquids. The liquid is delivered under pressure or by means of compressed gas or steam and is injected either continuously or intermittently. Continuous-flow injection is used, for example, in furnaces, gas-turbine and jet engines, and blowtorches; fuel is injected intermittently in, for example, diesel engines. Various types of injectors and their atomizers, which are sometimes called spray nozzles and are used to deliver the liquid, are shown schematically in Figure 1. In centrifugal injectors (Figure l, a), vortex injectors (Figure l, b), and rotary-atomizer injectors (Figure l, c), the liquid acquires rotational motion and flows from the atomizer in a thin film. In centrifugal injectors, the liquid is rotated by being delivered through a port (1) along a path that is tangent to the surface of the chamber (2). In vortex injectors, the liquid is rotated by moving through helical channels (3). In rotary-atomizer injectors, the liquid is rotated by the rotation of the injector housing (4). Jet injectors (Figure l, d) and pintle injectors (Figure l, e) deliver the liquid through cylindrical nozzles (5) or through annular slots (6) or plane slots. In the atomizers, the flow acquires a velocity that is sufficient to break up the liquid into fine droplets (a process called mechanical atomization) and ensures that the droplets enter the combustion chamber as a spray cone. In some injectors, steam or gas flowing from the atomizer together with the liquid is used for atomization (Figure l, f). A spray cone with a discharge of rotating liquid has the greatest angle of taper (up to 180°) at the nozzle tip; jet injectors with the liquid flowing from a cylindrical nozzle have the smallest angle of taper (10°–20°) at the nozzle tip. An injector may have a valve, for example, a needle valve ( in Figure l, d). Such a valve is used to vary the amount of material delivered and to begin and end the injection. The valve is controlled by hand, by the pressure of the delivered liquid, or by automatic devices. Injectors may be used to atomize water for controlling combustion and for regulating the moisture content of air or soil and to spray, for example, agrochemicals and fertilizer solutions. Devices that are similar to injectors but used for the atomization of gaseous or pulverized solid fuel are called burners. Podacha i raspylivanie topliva v dizeliakh. Moscow, 1972. A device to introduce, meter, and atomize the flow of fuel into the air flowing into a combustion chamber. The fuel is propelled into the combustion chamber under pressure other than atmospheric. On the other end of the scale sit piezoelectric injectors. The test showed that Interstate Diesel's injectors, both new and from aftermarket injector kits, provided exhaust opacity readings of zero through gradual increases in engine output up to normal high-speed operations, outperforming the other two injectors tested. Building on these previous insights, in the present study diesel injectors were sectioned and analysed to explore the reasons for non-uniform chemistries and morphologies along the injector, allowing for deposit formation and growth mechanisms to be postulated. Inspection found number two and number six fuel injectors plugged. The fuel injector is an electromagnetic valve, which injects the pressurized fuel into the manifold. The injector had two parts, with a total of 28 elements for channeling and mixing propellants. Early data from the test, conducted at pressures up to 1,400 pounds per square inch in a vacuum and at almost 6,000 degrees Fahrenheit, indicate the injector worked flawlessly. Then the fuel injector pump will have no problem doing its job. The snap-fit base eliminates the need for a separate quarter-turn adaptor, making installation of Philadelphia Scientific Injector systems faster and easier than other single-point systems. NISSAN has developed a dual injector system to improve fuel efficiency in small-displacement petrol engines. Nissan Motor has announced the development of a dual injector system designed to improve fuel efficiency in small-displacement gasoline engines. Why pay a shop $90 to clean your injectors when a few bottles of fuel injector cleaner can do the same job?